A big screen sugar-coated holiday fantasy about a sulking and insecure toy store clerk, the shop’s 243 year old owner who longs for death, and a neurotic bookkeeper called Henry The Mutant who thinks the death wish guy needs to be put out of business, doesn’t exactly sound like the ingredients for a children’s movie. 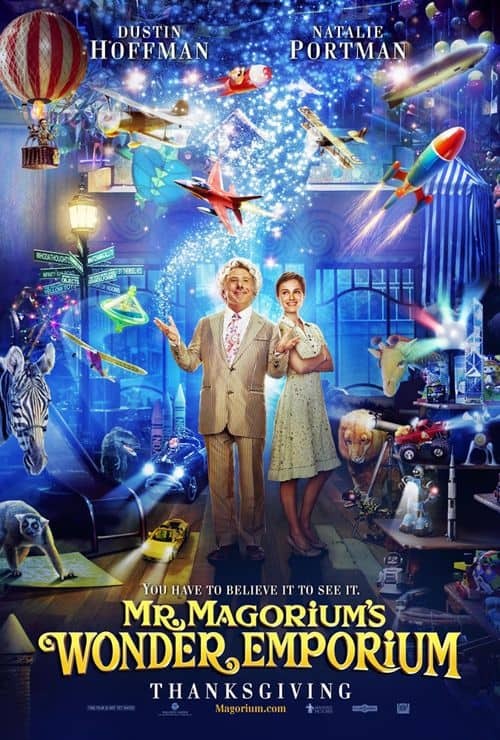 More feelbad fare than magical kid audience ecstasy, Mr. Magorium’s Wonder Emporium basically tunes into toys with major hangups, and the adults around them who are too busy with their own neurotic issues to dispense any TLC. Dustin Hoffman is the movie’s designated best buddy with the Grim Reaper, Mr. Edward Magorium The Avid Shoe Wearer and really old proprietor of the Wonder Emporium, a shop filled with toys possessing a life of their own. And though the gushing, gleeful little guy claims bragging rights to toys he’s made for Napoleon and Abe Lincoln – and one IOU slip from Thomas Edison posing next to a light bulb – he’s adamant about calling it quits with his mortal coil. Needless to say, the temperamental toys are really torn up about this sudden turn of affairs, exhibiting crippling despondency if not outright creepiness. Every last one of Magorium’s personally hand crafted collection of color saturated Whodathoughts and Whatchamacallits goes into extreme meltdown, turning all kinds of unpleasant grays and just plain refusing to further please any child consumer who happens by. Things get ugly every now and then too, as when a giant squash ball chases after a terrified kid customer, as it attempts to do just that. Nearly as dismayed is Magorium’s devoted, mousy shop clerk, Molly (glamour girl Natalie Portman doing her best with not much luck, to do mousy). Molly refuses to go along with Magorium’s death fixation because she’s much too attached to him. Not to mention that her plus size inferiority complex prevents her from imagining being able to run the shop without him around. Far less concerned is Henry The Mutant – and likely the audience as well by now, after Magorium’s endless babbling about being infatuated with death – whose accounting tabulations add up to a store full of fictional characters on the books, that would be better off shut down. Including the eviction of the mysterious macho tenant living in the cellar, who sleeps clutching a doll. Not so surprisingly, Mr. Magorium’s Wonder Emporium is directed by Stranger Than Fiction’s tall tale maven, Zach Helm. But a movie about a kooky genius equally in love with toys and death, hardly seems suitable for kids, even if the toys are awfully cute and zany. And by the time Molly undergoes some sort of self-esteem boosting religious experience, turning saintly and blessing all the kid consumer products back into life, the story has clearly taken an uncomfortable turn into spiritual toy worship, or something like that. One can almost hear the movie’s product placement department chanting, Mr. Magorium is dead. Long live the toys.